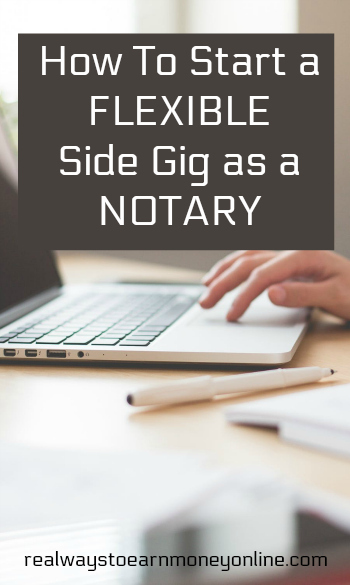 How to Become a Notary and Get Paid For Flexible Work! Published August 6, 2018 By Leisa Good This post may contain affiliate links. Regardless, I only recommend sites I've researched and/or used and trust. Have you ever thought about how to become a notary? This is a home business/side gig that many people in need of flexible or remote work consider starting. If this interests you, keep reading. Notary work could provide an additional income stream for you as well as help you serve your community. Most of us from time to time have needed a document notarized. A notary public or “notary” is an official appointed by the state government to act as an impartial witness in performing a variety of duties in non-contentious matters usually associated with contracts, international business, estates, deeds, wills, etc. The purpose is to act as a deterrent to fraud and identity theft as it relates to the signing of important documents. A notarized document is also recognized as a legal document by the court system in that state. Many industries need notaries to notarize for both their employees and their clients/customers. These industries include financial institutions, medical clinics, hospitals, law offices, county governments, insurance agencies, and technology companies. Who Typically Does Notary Work? Unless you are doing it for a company, many virtual assistants or virtual bookkeepers also offer notary services in addition to their other services. More often than not, these are mobile or traveling notary services. Rather than meet complete strangers in your home, you can offer to meet them at a business, their office, home, hospital or other location. I found a website, At Your Service Mobile Notary, which is run by a lady in California who not only has a mobile notary service, but also teaches others on how to set up their practice. If you're on a budget and can't afford a course, you could also check out this inexpensive e-book ($4.99) available on Amazon that teaches you what you need to know about becoming a great notary public. What Equipment Do You Need to Become a Notary Public? The two most common pieces of notary equipment are the notary seal and the transaction stamp. The notary seal is the raised embossed lettering which is used to show the notary's name, state, date their commission expires, and their commission number. Many states no longer require the seal, but are fine with just the notary stamp. There is also the transaction stamp, which the notary stamps and signs with his/her name and writes in the county, state, and the names of the parties involved and when the commission ends. Some notaries may also use a notary log book to record all of their notarized transactions. This is not usually a requirement in all states. You will also be given a guideline book for your state from the county where you plan on becoming a notary. Understand your state's requirements and certifications. Some states do not require training, and you may go to either a county courthouse or a local community college. Also, the National Notary Association is a great state-by-state resource as well as your local county's courthouse. Find out your state's requirements and submit an application. Pay the state's filing fee. Get any offered training and then take the exam. The NNA may allow you to do all of the training and examinations online for your state. However, please check first with your local authorities. Some states will only offer a handbook as “training”. Complete the background check and fingerprinting if applicable. Get a surety bond if applicable. Not all states require this. File all of your paperwork with your notary regulating official. Buy your notary supplies which are usually just the seal/stamp and then the transaction stamp. The amount you pay to become a notary will ultimately depend on where you live since the requirements and fees differ from state to state. However, it appears that in most cases you wouldn't pay much more than $200 (often less). Filing fees, fees for exams, and prices for supplies will vary greatly. To find out exactly what you'd pay in your state, a quick Google search for “How to become a notary in (your state)” should give you some results that include information specific to your state. How Can You Offer Your Services as a Notary Public? It gets you out of the house. You have to go out and meet the actual people involved in the transaction and do it in person, unless you can have them come to you instead. It is something that compliments other services, such as virtual assistance, transcription, and translation services that you may already be doing from home. It is a way to give back to the community. Sometimes those most in need of a notary are the homeless or those needing college transcripts notarized. It is easy to fit it around other ways to earn. I have even heard of Uber drivers who did notary work between app requests. What Are Some of the Other Perks of Offering Mobile Notary Services? With mobile notary services, the IRS currently allows .54 a mile which can be charged to the client for mileage. Then there is also the $10 transaction fee (will vary from state to state) to charge. Some notaries also become NSAs or Notary Signing Agents, who specialize in notarizing loans for the real estate industry. These notaries act as a liaison between the bank and the borrower. They also get to charge more for this service. Do You Need to Specialize With Your Mobile Notary Services? While you are welcome to notarize for whoever needs your services, most notaries will agree that having a specialty does help and keeps you serving in that industry. By specializing, you show that you really know and serve an industry. For example, you could offer your services to several immigration attorneys and offer translation services as well as transcription services to that industry. What to Charge For Your Notary Services? Again, that will really vary from state to state. The going rate is $10 per transaction. However, if you factor in .54 a mile from travel as well as offer a plethora of other services—your mobile notary service could become lucrative and open the door to your other services. The good thing about becoming a notary is to show that you are a person of integrity—you are even recognized as such by the courts. This adds credibility to any or all of your other services. Where to Advertise or Find Work as a Notary? Most mobile notary services advertise in their local Chambers of Commerce or BNI groups. These are great places to offer all types of services. However, don't stop there. You can form partnerships with local law firms, banks, financial institutions, etc. Creating a LinkedIn profile as well as having your own website listing your services are other ways to find work. Becoming a mobile notary service can certainly add integrity to your current services as well as help you build up a specialty or sub-specialty. It can also get you out of the house and serving in your community to those who really need your services. Notaries can be found in just about any industry or business—and you could become one of them!